If you’ve been following us for a few years as we’ve covered the SIHH you will have noticed that Baume & Mercier has been trying a number of different hats on for size, as it were. Of these, it is the last which grabbed our attention, and having had the opportunity to look at the new Clifton Club collection before the press presentation, we can say that we are in the camp that thinks that these new models are a win for Baume & Mercier and I can see them doing well in Australia. The first thing to note about these new models is that Baume & Mercier has not been known for ‘sports watches’ as such, so the Clifton Club stands out as something different from them (as a side note, they mentioned sports being a ‘way of living’ in their presentation). These have not been positioned as being an homage of anything, not as watches with some particular historical inspiration, but as a brand new collection which is, even speaking as someone who likes and owns historically-inspired watches myself, refreshing. The result? A sporty, simple, clean, well-executed, and good looking watch in a thoroughly modern size (42mm) and thickness (10.3mm) with a 100m water resistance and strap/ bracelet options that there’s no reason to think won’t be a crowd pleaser as a daily wearer. A nice touch is the use of both satin-brushed and polished surfaces, which accompany a unidirectional bezel with crisp clicks, lumed indices and hands, and the the industry-popular orange accents. Underneath the engraved case back is the reliable automatic automatic Sellita SW2601 (base Sellita 200-1) with thirty-eight hours of power reserve, quick date, and stop seconds. 1. Steel, black dial, orange accents, black leather strap with sailcloth texture and orange lining with folding buckle. 2. 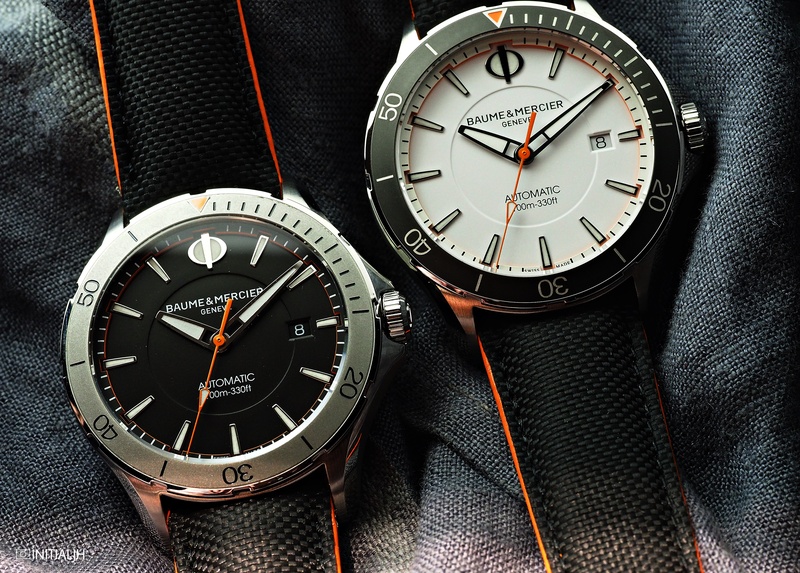 Steel, white dial, orange accents, black leather strap with sailcloth texture and orange lining with folding buckle. 3. Steel, black dial, orange accents, metal bracelet. 4. Steel, blue dial, orange accents, metal bracelet. 5. Black ADLC-coated steel, black dial, orange accents, black rubber strap with pin buckle. As seems inevitable in watches these days there is a date window, but on the plus side, the background colour is the same as the dial’s. We seem to be going through a phase where time-only watches are not as in-demand as those with the addition of a date. So what about pricing? It starts at 1,740 CHF for the first and second models listed above, then 1,880 CHF for 3 and 4, and for the ADLC model, 2,000 CHF.